There was a confusion regarding the VoLTE support on Nokia 6, Nokia 5 and Nokia 3. Some websites claimed that the new Nokia Android phones do not have VoLTE support. The others few claimed that it does, but there wasn’t a solid proof behind that. 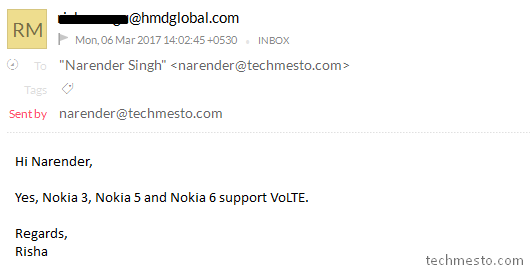 Now, HMD Global has replied to our email query, confirming that Nokia 6 has VoLTE support. We sent across the question to HMD Global. And according to the email reply, all the 3 Nokia Android phones come with VoLTE. This makes the new devices ready for Reliance Jio which has started a digital revolution in India. After initially offering free calls and data, Jio is now offering some really attractive tariff plans under the Jio Prime offer. The new Nokia phones with VoLTE support open up an option for more than 100 million Reliance Jio customers. VoLTE is also being adopted by more and more operators globally. Having VoLTE support makes the Nokia 6, 5 & 3 capable of competing in all the new markets moving towards VoLTE calling. Update: You can turn the VoLTE service on or off on the Nokia 6 by following this guide. nokia 5 . support jiopos plus. Tell me when this phone is launching in India. Sometime in the Q2 2017. Nokia has not yet announced any specific launch dates.